If you are anything like me then you loved art as a child, but have little ability and/or confidence to teach art to your own children. If this describes you then I know a program that may be right up your alley. ARTistic Pursuits offers a full line of art books that go way beyond your traditional art instruction books. Each book offers fun art lessons that combine art history with a full art experience, whether it be through painting, drawing, or sculpting. You may remember that two years ago I reviewed Stories of Artists and Their Art, by ARTistic Pursuits. Well, I was so excited to hear that ARTistic Pursuits is now offering a revised 3rd Edition of their books. These new editions offer additional art instruction specific to art materials and techniques used by artists. Although I found nothing lacking in the previous book I used, I was excited to get the chance to experience the changes for myself. I often feel that Margaret gets left out of meaningful and involved school time activities. She has her workboxes, but after schooling the three older boys I have little time and energy left to offer her. I was excited to receive The Way They See It for a review. Intended for ages 3 to 5, this contains 26 lessons designed to give preschoolers an early experience creating art. You, as the adult, will be given the tools you need to nurture and encourage your little one on her art journey. This is not a coloring or activity book. This book contains actual lessons structured around a famous work of art. After a short art study and discussion, this text will guide you in helping your child create a masterpiece in the same style as the one studied. I used the program twice weekly with Margaret. By reading ahead, I would place the book and an art materials in the last of her workboxes. When she saw the book in there, she was so excited because she knew it was an activity for just her and I (or her and Michael) to share together. She would patiently wait until I was finished with her brothers and we would begin her lesson. The program starts with a visual image to study and talk about. There are some discussion questions to help with the exploration. I was surprised how easily Margaret could talk about and discuss the art presented. She was always quick to point out the littlest detail that I had overlooked. How one group of colorful shapes resembled a fan that Japanese princesses hold, or that the vase of flowers in the windowsill looked really close to falling off the edge. I was a little worried that Margaret would get stressed and think she needed to create a picture like the one we studied. That wasn't the case at all. The way it is presented in the book focuses on the materials and method of art, not on copying or "creating your own version." Margaret couldn't wait to get out materials and create her own unique pieces. I thought this was a great program to give both adults and young children an introduction to art and art techniques. It gave me ideas and confidence in exploring different art forms and methods with Margaret. Young children don't need a lot of motivation to create art, but I learned that with a little instruction and guidance that they could learn to use art materials appropriately and learn to manipulate those materials in their own artwork. I LOVE doing my art lessons! 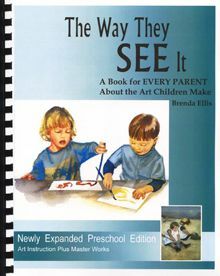 ARTistic Pursuits' The Way They See It is available for $47.95 on the ARTistic Pursuits website. In addition to this preschool-aged text the company offers products for Early Elementary, Elementary, Middle School, and High School. They also offer Art Supply Packs as an easy way to make sure you have the neccesary materials ready for projects. Other members of the Schoolhouse Review Crew used various products from ARTistic Pursuits. Click here to read those reviews or click the banner below. Great review! Your little girl is adorable! Ooo- Margaret's artwork is great! We reviewed the preschool book, too, and loved it.